The 14 partners of the consortium derive from four EU and two partner countries. They collaborate to create new curricula for universities in the Russian Federation and in Kazakhstan. Both countries share one of the longest borders in the world that requires close cooperation in trans-boundary management of common water resources. Both countries share the watershed of the Ob River and have similar national and regional priorities in the fields of higher education and environment. Both also want to develop partnerships with enterprises. Aim of this project is to intensify mobility and exchange between European universities and those in EU neighbouring countries, to internationalise the education of students and to develop new curricula following best practice principles. Graduates will benefit from improved professional qualifications. efficient management of the project implemented. 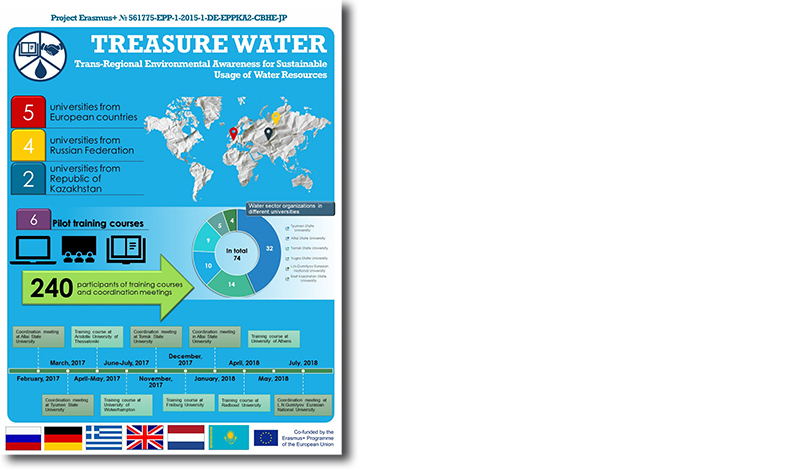 The TREASURE-WATER consortium consists of 14 partners, including eleven academic and three non-academic partners with Universities in Germany (Freiburg), England (Wolverhampton), Greece (Athens, Thessaloniki), and the Netherlands (Nijmegen). Of the EU partner countries, five Russian universities are participating from Siberia (1 in Tyumen, 2 in Barnaul, 1 in Tomsk, 1 in Khanty Mansiysk) as well as two universities from Kazakhstan (Ust-Kamenogorsk, Astana). Large-scale water suppliers, the German "Zweckverband Bodensee" and the Russian "Tyumen Vodokanal", also support the project. The project is co-ordinated by Professor Ralf Reski from the University of Freiburg. The TREASURE-WATER proposal was praised by the international reviewers among other things, because the University of Freiburg had already managed a consortium, also co-ordinated by Professor Reski, with the title "Qualifications Framework for Ecology and Environmental Management (QualFEEM)". In this completed EU TEMPUS Programme, the partners collaborated to modernise higher education in the partner countries. The project started in October 2015 and will finish in October 2018.